While this in itself is amazing, the truly amazing thing is that no one standing outside of the circle can hear a thing. A foghorn could be going off in the center of the circle, and those on the outside wouldn’t hear it…. Or rather, that’s how the legend goes. In reality, your voice does become extremely distorted when heard from outside the circle. Supposedly, the parabolic reflectivity of the circular planter walls causes the distortion. Many people have spent a lot of time studying how this effect is made, but there has been no consensus on what causes it. Whatever the causes of the distortions are, it is truly an amazing place. Located in downtown Tulsa at the apex of a rebuilt span of the old Boston Street Bridge between 1st and Archer Street, the Center of the Universe is easy to find. A brick path leads to the pedestrian bridge that goes over the railroad tracks, accessible from the corner of W. Archer St. and N. Boston Ave. It is located directly northwest of the old Union Train Depot (now the Oklahoma Jazz Hall of Fame), and immediately south of the Williams Center Tower. 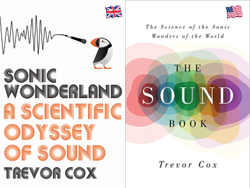 Hello Prof Cox, it is with delight that I hear you talking in several podcasts I am subscribing to. I would like to add a historic (UNESCO) site to your list of Sounds. The Great Pyramid of Cholula in Mexico. The Pyramid is dedicated to Quetzacoatl, the feathered Serpent. His character is also often likened to that of a bird. The acoustic phenomenon is that of a bird cry resounding when you clap in front of the Pyramid. A description of the Pyramid can be read on the Wikipedia site. For me it is really worth a visit, as the archaeological tunneling through the pyramid is accessible and reveals how these were built with fine wall paintings. Thunderhole explodes with a big boom when tidal water fills up a crack in the rock shoreline and the wave’s pressure builds up and explodes back out of the crack. Jaspers Beach is a beach of fist-sized smooth rocks, and smaller, that roll back and forth with the waves. Stereo recording of Porth Oer sand squeaking underfoot. The University of Alaska Museum in Fairbanks has an amazing listening experience called: The Place Where You Go to Listen. It is “a sound and light environment that gives voice to the cycles of sunlight and darkness, the phases of the moon, the seismic rhythms of the earth, and the dance of the aurora borealis.” All of these sounds are measured electronically and heard in real-time. No two listening experiences are the same there. A quick Google search for “The Place Where You Go to Listen” pulls up a number of videos from inside the exhibit. The video was recorder by friend of mine few years ago at the Seven Rila Lakes – Bulgaria. The place, where the sounds were recorded is know for its magical atmosphere and it is used ritually by group know as Danovists. The unnatural sound of the frozen lake sounds very interesting and reminds me to some old Autechre / Aphex tracks. It is one of the most interesting natural things that i have ever heard. Echo Ampitheatre in Northern New Mexico is great. Pretty much sounds as you would imagine a natural echo ampitheatre would. The singing ship. Rockhampton, Queensland, Australia. A sculpture that works with the wind. In 2011 I visited the Temple of Heaven in Beijing, a touristic hotspot in China. Part of this site is the ‘Circular Mound Altar’, a circular platform of marble stones where the emperor would pray each year for rain. The form, shape and materials of the platform not only amplifies a voice, but creates also an echo. Unfortunately it seems that no one has wanted to stand in the rain to get a video of it in action. This large boulder makes a very unusual low frequency sound when it is rocked. There are other examples of boulders like this- http://en.wikipedia.org/wiki/Rocking_stone. My hunch is they all make unusual sounds when they rock. In ouest of france (Bretagne) you also have “les pierres sonnantes” (ringing stones). Big rocks with old polished stroke marks. The were spitted by the legendary giant Gargantua. They sound like tuned metallic cans. I would like to suggest the Sound Stone at Gairm Scoil Chú Uladh in Beal an Atha Moir Lifford Co. Donegal, Ireland. It’s a man-made sound sculpture, using capacitive sensing to detect the presence of humans, which then controls a PD-patch that dynamically mixes sound samples. There’s a loudspeaker inside the sculpture, and the whole structure resonates. I suggest the Atkinson Carillon in London where a set of bells is played by punching a kind of keyboard. (There are a few carillons in the UK and many more in Europe.) Recitals have been known to take place on summer Friday and Saturday afternoons which may be heard in Old Bond Street. Curiously, I can find no recording on the web. Wikipedia has good information and a sound clip of one. The name barking sands is said to come either from the sound the hot sand makes as you walk over it, or the sound of the waves hitting the shore. The 90s grunge band Soundgarden was named after the park (not the other way around). Great Sand Dunes National Park and Preserve in Colorado, USA has booming sands too. It’s also a notably quiet place (aside from the wind and high-altitude aircraft). People have reported hearing their own heartbeat! Good place to experience natural peace and quiet, plus beautiful scenery since it’s nestled between the San Juan and Sangre de Cristo mountains. 1, the main burial vault at dashur pyramid egypt , stunning reverb , best to go there when there are no tourists and sing your heart out . 2,totnes castle , devon england , also stunning reverb and the sound travels around you , its circular. The amphitheatre at Epidauris, Greece is worth including. This was built in the 4th century BC and seats 14,000 people. It is one of the best preserved, and is still used for performance events. Apart from that it has superb acoustics, such that voices on the floor can be heard clearly from any seat. When I was there our guide lit a match and I could hear it strike while standing at the top of the amphitheatre. It has long been a puzzle as to how this worked, but recent research has put it down to the pitch of the seats. I saw a ‘squeaking beach’ on your map and thought I’d point you towards the “singing beach” in Massachusetts. It is probably the same sound, but a much more poetic name! Just came home from Belle-iles-en-mer in Brittany, France, and had the chance to visit the citadelle de vauban there, a baroque fort. In there is a round building made to store the gunpowder. Now an empty building there is a marvellous sound effect. Sounds are reverberated in a strange way so they seem to come from another point in the building than they origin from. I would not mark the sound effect word a trip, nor even word a detour itself, since belles-iles is an island and the gunpowder house is rather small. But when you have the chance to get to the island do not miss the chance for a visit in the powder room of citadelle de vauban. The High Tide Organ, by Liam Curtin and John Gooding, 2002. This sound scupture is on the Blackpool seafront opposite the north entrance to the Pleasure Beach. The sculpture was constructed in concrete, steel, zinc and copper sheet, and is played by the sea at high tide through eight pipes which are attached to the sea wall. These are connected under the promenade to 18 organ pipes within the sculpture. The swell of seawater at high tide pushes air up the sea-wall pipes and causes the organ pipes to sound. The pitches of the pipes are based on the harmonic series in B flat. You’ve mentioned the bird sound that comes from the Mayan temples at Tikal and Chichen Itza, which is very interesting, and was an accidental discovery when a tourist clapped his hands. But the same phenomenon can also be found at the much older temples at Teotihuacan as well. Feel free to contact obrandts@gmail.com for more info. The Cincinnati Museum Center (housed in Union Terminal) has a whispering arch in it’s grand lobby. Worth a trip if you’re in the area — and not just for the acoustics. Union Terminal is an art deco masterpiece, and the museums it houses are all wonderful. My favorite is the Natural History Museum. For booming sand dunes I would add Khongoryn Els, high dunes in the south of Mongolia in the desert Gobi. Their name actually means singing sand in Mongolian. They indeed were droning when we were there. Some of the claims on the website are a bit hard for me as a scientist to agree with, but there is no denying that this hemisphere has a great focussing and reverberation effect. It’s a pretty spectacular place, but the sound of the church bell ringing out in the evening was something else. With the natural reverb of the mountains, It sounded like 10 or 20 bells – even though it was just one I think. I’d never heard anything like it. I’d heard some electroacoustic compositions take aim at that kind of sound, but this is the real deal. Sat there listening to the infinite variations of the bells harmonics for at least 30 minutes. There is one more site in south India, called Hampi, which has musical pillars. It’s quite a famous location with beautiful carvings and architecture (half-destroyed by Moghuls!). Those pillars produce musical tones when they are hit. You can see the guide demonstrating it in the following video. There are plenty of videos over youtube, just search for “musical pillars india”. OH bother, I just saw that that church has already been suggested. Ignore me. How about St. Burchardi church in Halberstadt, Germany? There’s a performance of John Cage’s ‘As Slow As Possible’ being played on the organ there, which began in 2001 and is scheduled to have a duration of 639 years, ending in 2640.
hey trevor! you should definitely come to nz. for such a small place I think you’ll be suitably impressed (Barron was). We have two excellent examples of concert halls. one that is reliant on reflectors (christchurch – i hope it is fine) and one that is uses QRDs (wellington). Besides it is generally very quiet. there is an interesting spot to mention: the underground parking area at Villa Borghese in Rome. In this avant-garde project of the architect Luigi Moretti you can find a series of small cupolas. If you keep talking in the middle of them, you will be suddenly reached by the multiple reflections all around having the chance of experiencing a flutter echo and sound coloration: the sound “bounces” up and down and it turns to be very funny! By the way, great website and many thanks for your remarkable effort in promoting acoustics! i think i have a good add for the Japan category. In the City of Nikko are several shrines and in one of them they always give you a little sound exercise of the Naki-Ryu – the so called crying dragon. This one shrine has such a unique acoustics which a priest is demonstrating all through the day be striking a wooden chime which then makes a sound echoing around in the room making the sound of a crying dragon. See the youtube video for that. Nikko is a city about 2 hours (140km) north of Tokyo in Tochigi prefecture – kind of in the middle of Japan. There is also some place in Texas that is supposed to be close to the Port Townsend 45 second delay. The Tunnel Singer produced a CD in there that she sings on top of herself harmonies in real time. Its beautiful and called WaterBirth. There is a strange (and small) sound mirror in Pau (France). It’s located on the campus. you can hear an echo of your voice as you pass through it. Cistern at Fort Warden, Port Townsend, WA. Claims of a 45s reverberation time. Not sure if it can be visited but artists can pay to use the space. It has been used by recording artists such as Stuart Dempster. I would suggest the Emanuel vigeland mausoleum in Oslo. It has a reverberation time of about 20 and very sparse lighting so the murals don’t appear properly until your night vision kicks in resulting in a pretty intense audio-visual experience. It’s open on Sundays for tourists but they have some concerts there on weekdays as well. How can you people miss Hampi’s Musical pillars at Vittala Temple?? It is in Karnataka,India.